The school is always eager to establish ties with schools in other countries to expose our learners to other cultures and opportunities that come with such exposure and to broaden their horizon and enrich their lives. Key educational objective that the partnership will pursue will be to challenge and inform perceptions of global citizenship and sustainable development. 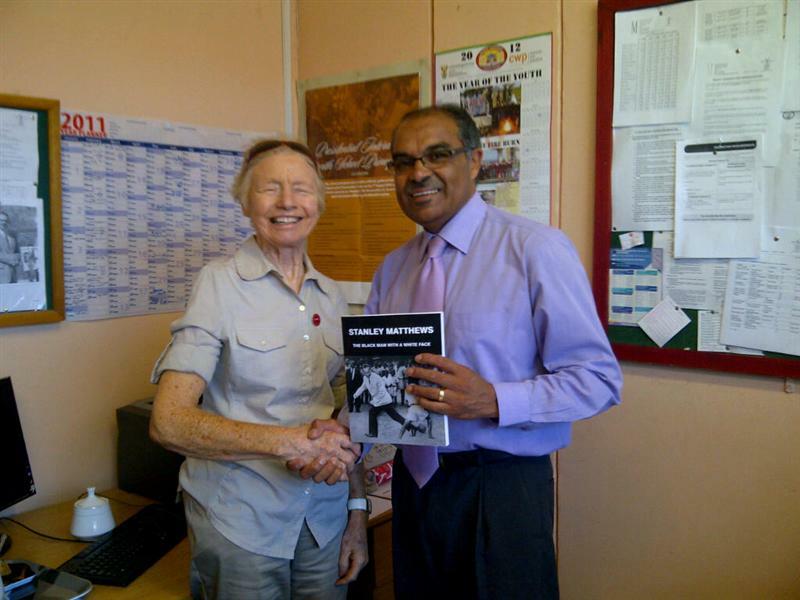 JEAN MATTHEWS (DAUGHTER OF GREAT SOCCER PLAYER, SIR STANLEY MATTHEWS) WITH THURSTON BROWN (PRINCIPAL, MANENBERG HIGH SCHOOL). JEAN ACCOMPANIED OUR PARTNER SCHOOL IN THE UK, STOKE-ON-TRENT COLLEGE, DURING A VISIT TO OUR SCHOOL. 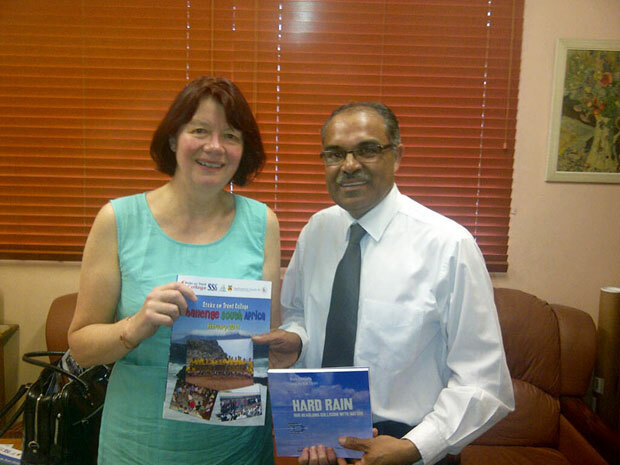 JOAN WALLY (BRITISH MP) WITH THURSTON BROWN (PRINCIPAL, MANENBERG HIGH SCHOOL). JOAN WALLY WAS INSTRUMENTAL IN SETTING UP THE PARTNERSHIP BETWEEN STOKE-ON-TRENT AND MANENBERG HIGH SCHOOL. A second exchange programme has been started with Artesia High School in California, United States of America. The focus of the project is HIV & Aids related. Learners will be looking at the social, political and economical impacts that HIV & Aids have on their respective communities. A total of four teachers from Artesia High School visited Manenberg High School during August 2011 and five teachers from Manenberg High School visited Artesia High School during October – November 2011. The school was also involved in the Irish Amawela program. Amawela is an isiXhosa word meaning twinning. 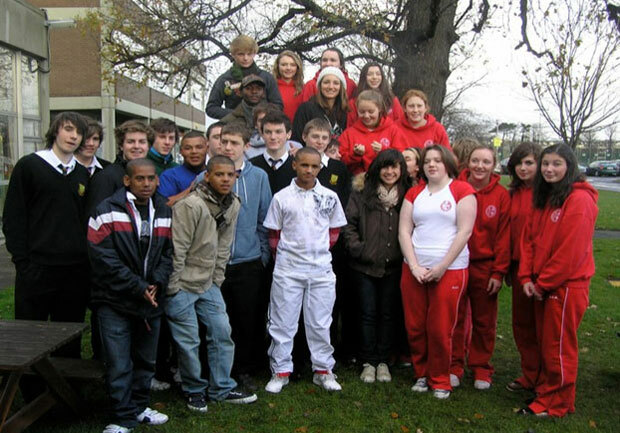 Our school was twinned with Alexandra College in Dublin, Ireland. The Amawela program had to be abandoned due to the financial crises that hit the European countries and especially Ireland very hard during 2008-2009. The school has a partnership with Yale College in Wrexham, Wales since 2010. Yale College visited our school thus far on two occasions during 2010 and again during 2011. They came to our school with a different focus. Their focus is mostly centered on transfer of media skills through highly technological means, e.g. photography, film making and digital story telling. View a letter elaborating on Yale’s visit to Manenberg by the teacher co-ordinating our partnership with Yale College. This is not the first time we are involved in a project of this nature. We are officially connected in England, Ireland and now also Wales. Our school was quite impressed with the totally different activities the Welsh teachers and students brought to our school. Usually the focus is sports coaching and classroom interaction. Yale College brought new things and very exciting activities to our school and inspired learners as well as teachers to continue to the best of our abilities with limited resources with projects that was started by the students and teachers of Yale College. Our students and teachers were really impressed because during the Welch activities they used technology which our learners were never been exposed to before. We realise through these activities that every group brings something different to our school. These activities provided us with new ideas, for example in January we started a Newsletter group amongst our students. We decided to change it to a Media group after learning about digital stories, film making and photography. We are also developing a cricket interest at school. Our students frequently ask me when they can view the digital stories. Many of our students do not have access to technology, or have limited exposure to it, but as a result of the various workshops they have become more aware and interested in photography and film-making. They really enjoyed themselves capturing shots with the camcorder and taking photographs. Our students all have different talents which need to be identified and then nurtured and these workshops have certainly given the majority of them the opportunity. Our students and teachers look forward to hosting the Yale group again next year. Students constantly want to know when the Welsh group is coming back to our school again. As part of their visit to Manenberg, coaching was conducted at one of our feeder schools, Talfallah Primary. The young learners really enjoyed those activities. Hopefully in future we can arrange these types of activities at other neighbouring schools so that the Greater Manenberg area can benefit from the Welsh group’s visit. Myself and one of the Yale students, Emily Roberts had some discussion about our area Manenberg. In Cape Town the media tend to concentrate on the negative things about Manenberg. Films were made filled with negativity about our area focussing on gang life and gang activities. Myself and Emily committed ourselves to eventually attempt to produce an amateur film / documentary focussed on the positives of Manenberg with the assistance of our learners. Many people from Manenberg need a success story to inspire them positively. The positive things happening in Manenberg outweighs the negative things. It is important to show people more about the positive things so that they can have a balanced view, and not a biased one of a place in South Africa, Cape Town called Manenberg. Outside of school hours we, the teachers and learners of Manenberg High, were honoured to spend time with the Yale College group, accompanying them to different tourist sites, e.g. historical significant places around Cape Town. Through these types of interaction strong bonds of friendships developed which will hopefully last forever. Learners from both schools are still in contact with each other, thanks to technology. These international projects were definitely life changing experiences to our learners ,learning about other cultures , creating opportunities to expand their view of the world and communicating with people of other parts of the world. Lastly, we thank the group from Yale College , Meryl , Paula , Mark , Amy , Vicky , Emily , Roxanne , Gavin , Jess , Richard , Gemma, Holly and Abby.